STOCKHOLM / ROME, Apr 15 2019 – The Academy Awards, i.e. The Oscars, may occasionly award a worthy movie as Best Picture, though it is far from sure they select films with a unique artistic vision, enduring cultural influence and/or innovative qualities. Take for example the plain family drama Kramer vs. Kramer, which in 1979 won Best Picture and Best Director, while Francis Ford Coppola´s by now classical epic Apocalypse Now was awarded for best sound. The 2019 Academy Awards rewarded the feelgood, racial drama Green Book as Best Picture, while Spike Lee´s sophisticated onslaught on American racism, BlacKkKlansman had to settle for Best Adapted Screenplay. The Mexican Roma won several prizes, including Best Director, Best Foreign Language Film and Best Cinematography, while the Colombian Birds of Passage, suddenly and inexplicably was removed from the list of nominees for Academy Awards. Birds of Passage may be placed beside avant-garde movies by Sergio Leone, Akira Kusosawa and the lesser known Glauber Rocha. Filmmakers who transformed the classical genres of American cinema, i.e. Westerns and Gangster movies, by refashioning and reinvigoarating them into a new artform. By providing Birds of Passage with the subtitle Once Upon a Time in Colombia, Guerra and Gallego indicated their gratitude to Sergio Leone. Once Upon a Time in the West and Once Upon a Time in America were the titles of films by Sergio Leone, whose work came to be a crucial inspiration for auteurs like Coppola, Scorsese and Tarantino. Leone has been called cinema´s Great Romantic Poet. In spite of intially being brushed off as a manufacturer of low budget action movies, Leone is now appreciated for his extraordinary talent of combining photo, action and music into a strong, intense unity. Being the son of a cinema pioneer and a silent film actress, Leone grew up as an admirer of Italian grand opera, an aspect perceivable in his movies, where the drama is heightened by aestethics expressed through extreme close-ups, long sweeping shots integrating the landscape with the story, and not the least his use of Ennio Morricone´s music. These qualities originated partly from Leone´s admiration of Akira Kurosawa, just like this Japanese master Leone interspersed his narratives with short, intense and often quite unexpected sequences of sudden violence and frenzy. Lately, film critics have also discovered that below the surface of Leone´s operatic Westerns and Gangster movies lurks a vision of the growth of an American society immersed in greed and corruption. A depiction of moral decline that even if it is more fantastical than realistic, nevertheless is true. When asked why he called some of his movies Once upon a time … Leone explained that they were ”fairytales for adults”, portrayals of bygone eras seen through a lense that enchanted a harsh reality. His movies are like operas and some may even be viewed as legends with a moral message. Leone´s aesthetics may provide a hint to the imagery and narrative structure of Guerra’s and Gallego´s Birds of Passage. A film in which we are confronted with similar desolate landscapes, panoramic views, sudden oubursts of intense violence, paired with long sequences characterized by reflection and waiting. In the Colombian movie we also find intricate symbolism, expressed through the presence of birds and insects and sometimes specific coulours, like red and black. It is set within a temporary, yet mystical, landscape encapsulated by the lore and customs of the Wayúu people. As Leone´s movies where the narrative is accompanied by Morricone´s mood creating music, the Colombian movie´s score is an integrated part of the tale, with insect – and bird sounds that blend with vibrating, unfamiliar instruments it occasionally creates an almost hallucinatory effect. Birds of Passage depicts the so called Bonanza Marimbera, when people in the Guajira region of northern Colombia during the 1960´s and 1970´s became involved in big scale drug smuggling to the US, the offset of Colombia´s notorious celebrity as a source for global drug traficking. A fame that eventually gave rise to documentaries, movies and TVseries, offering thrilling tales about mass murderers like Pablo Escobar. However, Birds of Passage is far from being what several reviewers assumed – just another movie about the rise and fall of druglords. It is a multifaceted work of art reminding us that Colombia was the birthplace of the great magical realist Gabriel García Márquez. The author´s maternal family was Wayúu, the indigenous people at the centre of Guerra’s and Gallego´s tale and just like Birds of Passage García Márquez´s masterpiece One Hundred Years of Solitude includes numerous influences from the mystical lore of the Wayúus. Contrary to the Mexican Oscar winner Roma, where the maid at the centre of the tale was no more than an idealized, but strangely anonymous, indigenous woman, Birds of Passage is told from the perspective of the Wayúu, among whom spririts walk the earth and dreams carry important messages. The Wayúu are not depicted as exploited innocents, they are flawed indiviuals just like the rest of us, victims of greed and passions. The story begins in the late 1960s. In an arid, windy area Zaida undergoes a ritual, involving a dance to attract presumptive suitors. Rapayet is bent on marrying Zaida, but her mother, the matriarch Ursula, is not happy about him, even if the orphaned Rapayet is nephew of the Word Messenger, a respected elder with important ritual tasks. Ursula demands an extravagant dowry of 50 goats, 20 cows and four precious, ceremonial necklaces. Together with his friend Moises, an alijuna, outsider, without any respect for Wayúu traditions, Rapayet makes contact with a group of American Peace Corps volunteers, who are more interested in making profitable marijuana deals than in development work. Rapayet’s cousin Aníbal, a clan leader who grows marijuana up in the sierra, becomes part of the business and Rapayet can afford to purchase his dowry and marry Zaida. The Wayúu world where sunglasses, pickup trucks, goats, horses and Cessna planes, comingles with colourful silk dresses and traditions and beliefs of an ageold tribal society, soon becomes affected by the violence and greed of a burgoning drug trade. As fortunes grow, Rapayet becomes entangled in a web of violence, social decline and an impossible duty to uphold of Wayúu rules and morals. 1. 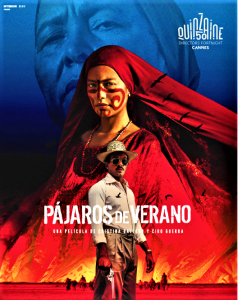 With Birds of Passage Guerra and Gallego join ranks with Leone, Kurosawa and Rochas as great innovators, creators of aesthetically pleasing, excellently composed visions of worlds far removed from mundane cliches and plagiarisms of mainstream Hollywood productions. Furthermore, they represent an invigorating voice from the South. That this powerful film may be called an instant classic is that it deserves to be revisited and analysed several times. Its beauty and multifarious craftmanship make it a sequel to other impressive masterpieces.